The backer rod most importantly acts as a bond breaker, preventing what is commonly referred to as three sided adhesion. This is when the sealant is adhered to the bottom and both sides of the joint. 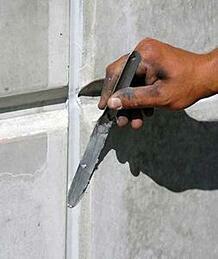 In this configuration the sealant cannot move nearly as well as when it is only bonded to the sides of the joint. The backer rod supports tooling so after installation of material the sealant can be pushed to the bond line with a spatula, ensuring wet-out of the sealant to the substrate. The final main feature of the backer rod is that is promotes an hour glass shape. This maximizes the bond area but keeps the depth of sealant consistent in the middle allowing for movement. The backer rod comes in three main types, closed cell, open cell, and a hybrid that has closed outer cells but open interior cells. Each one of these types of backer rod has its own niche that it thrives in. Open cell backer rod is great in terms of application, it is very easy to compress and in can even help facilitate the cure of the sealant from both sides instead of an outside to inside direction, or top down. Typically sealants will cure through a reaction with atmospheric moisture or evaporation. Using a permeable backer rod will allow the sealant to react with atmospheric moisture to cure on the interior side. Open cell backer rod should not be used in flat or horizontal joints that can have water ponding on them as they can wick moisture to the underside of the sealant. The closed cell backer rod is best in horizontal or flat joints as its closed cell structure keeps moisture from wicking through it. It is much more robust which can make installation more challenging when compressing the backer rod into joints. This backer rod should be installed carefully because if it is punctured and then sealant installed directly over top a void is created. That void, filled with air, will then expand as it is heated through typical day to day temperatures and sunlight causing unsightly bubbles. This is commonly referred to as outgassing. The hybrid style backer rod is easy to install with the internal open cell structure it can compress easily. Since the backer rod has a closed cell exterior it can be installed in horizontal or flat work because it won’t wick moisture through itself. As mentioned previously each backer rod has its own niche that it excels in and this information should be considered when selecting your backer rod for you next sealant project. Please consult your local Tremco representative or Technical Services for assistance.